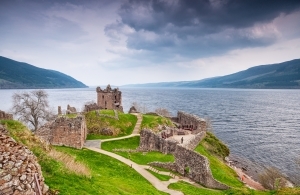 Located directly on the famous Loch Ness in Scotland, Urquhart Castle is one of the most popularly visited and picturesque castles in the Highlands. The castle is to be found 21 kilometres (13 miles) south-west of Inverness and 2 kilometres (1.2 miles) east of the village of Drumnadrochit. It is built on Strone Point, a triangular promontory on the north-western shore of Loch Ness, and commands the route along this side of the Great Glen, as well as the entrance to Glen Urquhart. The castle is very close to the water level, though there are low cliffs on the north-east side of the promontory. The magnificent panorama surrounding the castle, which gives one a unique unobstructed view over the 700-feet deep Loch, is one of its main attractions. Urquhart Castle is one of the largest castles in the Scottish Highlands. The walled portion of the castle is shaped roughly like a figure-8 and aligned northeast-southwest along the bank of Loch Ness. It is around 150 by 46 metres (that is, 492 by 151 ft), forming two baileys; the Nether Bailey to the north, and the Upper Bailey to the south. The curtain walls of both enclosures date from the 14th century, though it was augmented later, particularly to the north. The castle is surrounded by a dry moat, which is 30 metres (98 ft) across at its widest point, and which was probably excavated during the early Middle Ages. On the inland side of the Nether Bailey, one can find a 16th century gatehouse, which flanks an arched entrance passage. Over the entrance are a series of rooms, and collapsed masonry dating from its destruction after 1690, surrounds it. The Nether Bailey is anchored at its northern tip by the Grant Tower, which is the main tower house or Keep. The tower measures 12 by 11 metres (39 by 36 ft), and has walls up to 3 metres thick. Originally five stories high, it remains the tallest portion of the castle, even though the southern side of the wall had collapsed in a storm in the early 18th century. One can see machicolations, that is, narrow slots through which objects could be dropped on attackers below, above the main door on the west, and the postern gate to the east. The western door is protected by its own ditch and drawbridge, accessed from a cobbled ‘Inner Close’ separated from the main bailey by a gate. The surviving interior sections can still be accessed via the circular staircase built into the east wall of the tower. These would have comprised of a hall on the first floor, rooms on the other two floors above, and attic chambers in the turrets. To the north of the tower is a range of buildings built against the curtain wall. The great hall occupied the central part of this range, with the Lord’s private apartments in the block to the north, and the kitchens to the south. The Grant Tower is by far the best preserved part of the castle, and extends from the vaulted cellars up to the original wall-head and gable. Visitors can explore the various levels via a very narrow spiral staircase, and also enjoy the views south over the castle, and east and north over Loch Ness. The Upper Bailey is situated on the rocky mound at the south-west corner of the castle. This mound is the site of the earliest defences at Urquhart, since it is the highest part of the headland. A 16th century water gate in the eastern wall of the Upper Bailey gives one access to the shore of the loch. The buildings nearby may have been stables, and to the south there is also a pigeon house and a smithy. At present, the drawbridge has been replaced by a wooden gangway, over which tourists can walk to enter the site of the castle ruins. Urquhart’s history is also told through a remarkable collection of artefacts left by its residents, as well as historic replicas, including a life-sized, working trebuchet siege engine found within the castle’s grounds. A trip to the large visitor centre flanking the castle is a must. One can admire a detailed model of the castle, depicting what it would have looked like in its prime. The exhibition also consists of an audio-visual theatre and an 8 minute informative movie about the history of the castle before it was demolished. There are also a coffee shop and a souvenir shop which provide stunning views of the castle. 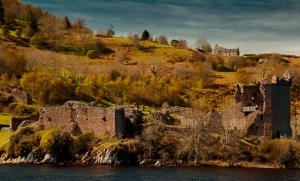 In 2011 more than 315,000 people are reported to have visited Urquhart Castle, making it Historical Scotland’s third most visited site after the castles of Edinburgh and Stirling. The castle can be booked as a venue for wedding receptions and is very popular due to its fairytale setting. The mesmerising bright blue of Loch Ness nearby also puts one in mind of the famous legend of the Loch Ness monster, or ‘Nessie’, supposedly a dinosaur-like creature which has been sighted many times swimming along the Loch, since the 1930s. Many scientists and tourists have claimed to have spotted Nessie, but few or no evidence was ever found of its existence. 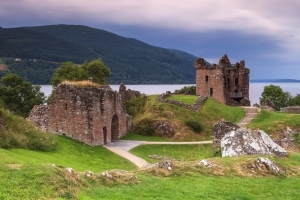 Apart from the famous legend of Nessie, Urquhart Castle stands at the centre of another, less known legend pertaining to a local treasure hoard of Jacobite gold. It is told that Spain had financed a Jacobite Army with 400,000 gold livre a month. Seven boxes of these coins had arrived in 1745, and were reputedly hidden in the forests around Loch Ness and Urquhart Castle and never found. One can also visit the castle as part of a boat tour down the Loch. This would be a perfect opportunity to soak up the atmosphere of both Loch Ness and Urquhart Castle. There are many boat trips available, especially from the nearby village of Drumnadrochit.